You can upgrade your monthly plan at any time. 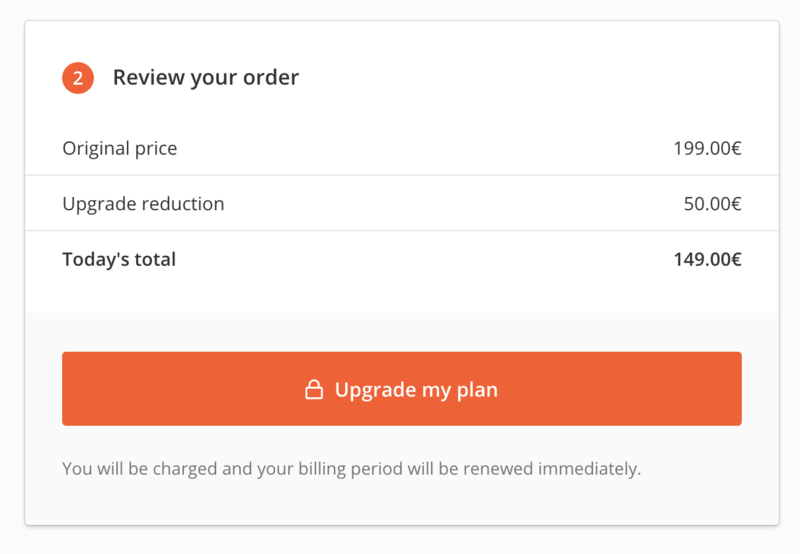 For example, if you upgrade your subscription in the middle of your billing cycle, the remaining 50% of what you paid for the current subscription based on your requests usage will be applied to the new plan. Here's an example: for this Growth (5000 reuqests/month) plan 2500 requests were used. The Pro plan upgrade in this case cost 149€ instead of 199€. N.B. When upgrading your plan the new subscription will be applied immediately and you will have access to the new number of requests associated with the new plan. A new monthly plan will also start from the upgrade date. The only reason this would not be the case is if your account gets frozen upon purchase, in which case you should get an email from us with the necessary steps to fix this.